Topic: "Compelling Conversations: Influencing Positively and Powerfully"
Do you know how to ask for and get what you need in the workplace? 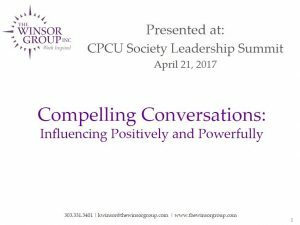 Kathleen Winsor-Games answered this and other questions during her presentation at the CPCU Leadership Summit, April 20-22, 2017 in Baltimore, MD. Whether you are a leader of a dispersed sales team or a solo contributor who longs to move into your first management role, your ability to crystallize and articulate your vision and win others over is a major key to your success. How well do you understand the motivations, communication style, and decision-making process of those around you? 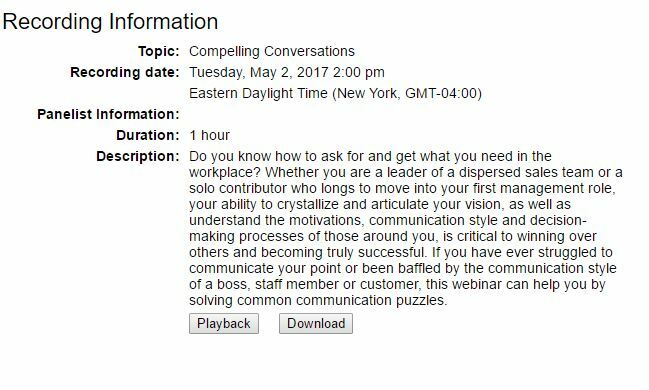 If you have ever been baffled by the communication style of a boss, staff member, or customer, this session can help you solve the puzzle. Click here to download Kathleen’s CPCU Society Leadership Summit presentation, click here. Are you in line for a promotion, or have you recently received a promotion? Would you like to receive more recognition for your accomplishments, but aren’t comfortable with talking about yourself? Most of us were raised to believe that “it’s not polite to brag”, yet we know there are secrets to getting recognition and respect in the workplace. In order to be promotable and effective, no matter your level within the organization, you must master the skills of managing up, out, and down. 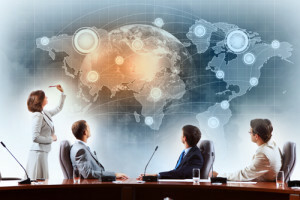 Communicating with senior management takes a different skill set and different messaging than influencing your peers, or leading your staff to accomplish its goals. Kathleen presents to companies and professional associations on the topics of Team Building, Personal Branding, and Building a Better Company Culture. What would it look like if you were driving your career according to your personal values, vision, and strengths? How would it feel if you had choices and your expertise was sought out by recruiters and top companies? In today’s world of work, it’s no longer enough to show up and do a great job. What’s required is the ability and know-how to take your career into your own hands. Are you using tactical and reactive tools to manage your career, or do you have a well-thought out strategy? Do you understand the keys to building a compelling personal brand? Join us for this refreshing look at the top ten things you can do this year, this month, right now to accelerate your career satisfaction and ensure that you are a sought-after talent.